Mr. Walker's Blog: What will I see when I search? What will I see when I search? Last week I had the opportunity to present to a creative writing class in our high school. Being in the role of assistant principal it's not often that I have the opportunity to teach a mini lesson. I was asked to introduce students to the idea of creating a digital portfolio in which they will publish the various formats of writing that they will be crafting in this class. The teacher and I developed a template using Google Sites for students to work with as they develop their portfolios. While this opportunity could have been a simple tutorial in which I demonstrated the "technical intricacies" of Google Sites, I was compelled to pair this with a discussion on online reputation management and the power of publishing. In the era of social media, smartphones, and mobile apps the ability to publish online is not only accessible, but enticing. Sharing online is the most common form on communication among students. Over the years we have educated students about the danger of online publishing. Our message has been about protecting your identify and minimizing the availability of personal information. We have also spoke about the dangers of anonymity. The talk of 'being safe' expanded to reputation management. 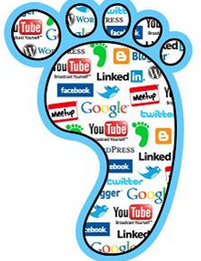 Students have been exposed to conversations regarding their digital footprint. We have focused on the permanency of what we share online and the outcomes that may be a result of these actions. In speaking to this class of students I asked how many of them have ever Googled themselves. I was surprised to see only about 10% of the students responded yes. When I asked them what they have learned about online publishing they were quick to cite the topics I discussed above. In my conversation with them I challenged the idea of protecting your identity online. We discussed who may be looking for you online. Employers, college admissions officers, friends and family were discussed. My approach regarding this audience shifted their thinking from "be careful with what I share" to "what are you publishing online under your full name that adds value or differentiates yourself?" "How can you create a digital footprint that puts you at an advantage over others when applying for a job or seeking admission into a University. When working with students we should be modeling best practice strategies in online publishing. Students should be sharing their best work, thoughts, ideas and creations for the world to discover. A Google search of your name should uncover the products that best represent you. Examples may be not only writing portfolios, but art work, images, or comments on publications. As educators we should be working to develop the skills required to publish online. Authoring for the web requires an understanding of how we read online. The quality of the content must be paired with an appreciation and understanding of intuitive design and rich presentation.